Just got it home and it's a VERY nice guitar. I really don't know from what year this is or what model, but from reading Nils great paper my guess would be 1982-1984, judging by the pickups(L8000? ), truss rod cover (if it is original) and electronics. Am i on the right track? BTW, does anyone have a catalouge where this model appears? I have only seen scans from 79-81. Nice the way the binding has yellowed with age. I just saw that this model appears in the 1985 burny catalogue on the Fernandes official page as RLC-65. Does anyone have the 1982-1984 catalogue hiding somehwere? When did they change the headstock diamond inlay? What is confusing though is that Nils paper sais that the VH-4 pickups has black wire, and the ones in my guitar have grey wire which makes them look like L8000. Maybe this guitar was introduced in 1984? Would be nice to see a catalogue from that year. Yeah It could be a 1985 model with leftover 83/84 pickups or it could be a 1984 model, impossible to tell. 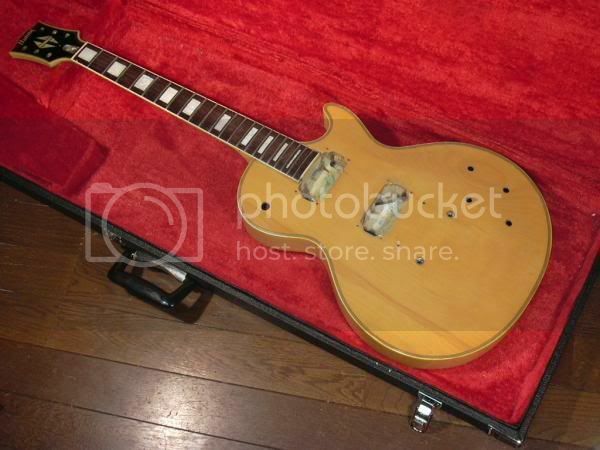 One thing is clear, it is one of the early models with solid mahogany body and Gibson style inlay!! I'm not sure, that there is a 1984 catalogue, never seen one. The reason I stated, that the RLC 65 model was introduced in 84 was because of the pickups. I have seen examples with black wire and Gray wire and my guess is that the grey wire ones is 1984 models, because there is no RLC 65 in the 83 catalogue - but I maybe wrong. My guess is, that they stopped making RLC with solid mahogany bodies at the same time they changed the headstock inlay around 86/87. Is there anybody out there who have got a mapletop RLC with old style headstock inlay? Sound wise I can't tell the difference between a 83/84 L8000 pickup and the 1985 VH4 pickup. Maybe the only difference is the colour of the wire? Hello Burny 123, your wrong buddy , i have a early RLC cream custom with a maple top. Guess that throws a spanner in the works, its definitely maple as the finish has been sanded of the top and i'm going to have it refinished with a custom black and cream flame job. Okay so I?m wrong, what kind of pickups in Your guitar ? BTW, the pickups sounds great! The string height is also very low and the guitar is very resonant. A great guitar, over my expectations. I will get more Burny's of this era, that's for sure. leadguitar_323 Was the color black original? And what pickups does it have? And Bart it was aged white. If i have interpeted the 1985 Burny catalogue correct there was VH-3 pickups in the Randy Rhodes Custom. Maybe only those had maple top. Hi Bart, mate i've seen them with vh1's as well i think it depends on the model numbers. A very nice Japanese guy translated some parts of the catalogue for me, especially the RLC section from 1985. Seems like the black ones had all mahogany body. The 60's slim neck does not apply for my guitar though. But I am not 100% sure the translation sections.